Join us April 22nd from 10am-12pm! Round Offs, Back Handsprings, Back Tucks, Twisting and More! Don’t miss this great opportunity to prepare for upcoming CHEER tryouts or just come improve your tumbling skills. 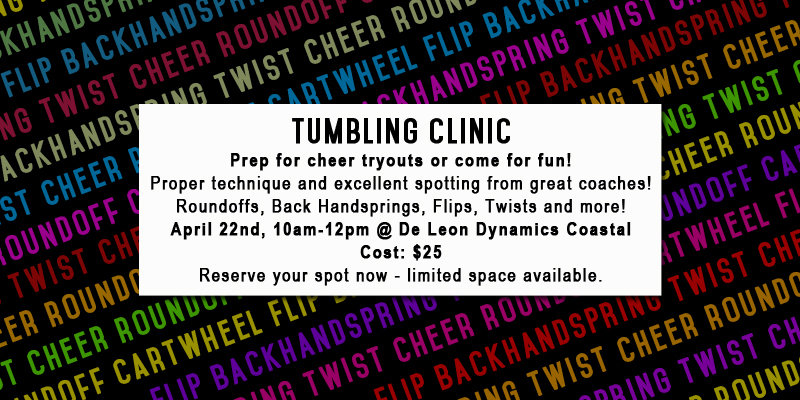 Our coaches have competed at and coached very high level competitive gymnastics – now they are bringing their skills to De Leon Dynamics Coastal – we know that this clinic will be very beneficial to all participants. Saturday, April 22 from 10am-noon.